There many free email services out there, and the most used ones are Gmail, Yahoo and Hotmail. So you can always open an email account with the desired user name, if available. All the email accounts have a form as username@mail.com. So for example you can have JohnSmith@yahoo.com, However since there are lots of John Smiths out there you might end up with JohnSmith765@yahoo.com, or JohnSmith@mail.com. So in order to open an email account, go to your web browser and type in one of the three websites, gmail.com, yahoo.com or https://login.live.com/, and there you can open an email account. Click sign up and follow to the screen below. 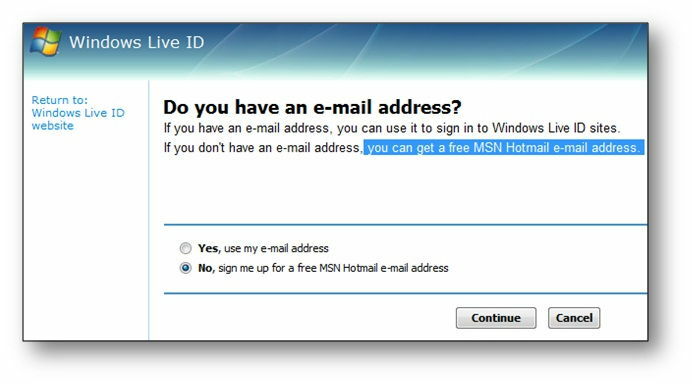 There you can create an email address by selecting the NO, Sign me up for a free MSN account… if you don’t have an email address already. 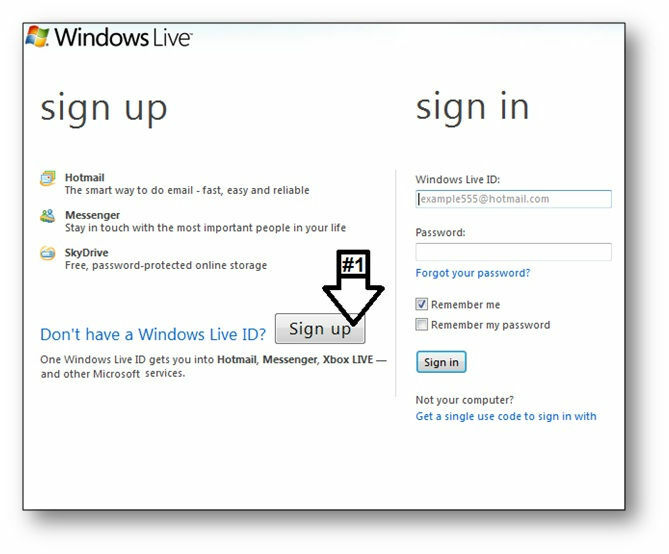 Or create windows live ID with your existing email address (regardless of the email provider) to benefit from Windows Live perks such as sky drive and others. Basically a Windows Live ID previously called a Passport function like a passport. You only need one passport and you can visit any country where the diplomatic relationships permit. You don’t need a passport for each country. The same way windows live ID functions for all Microsoft’s services, which require authentication. Make your choice and lick the Continue button. The complete the form with your credentials and make sure you complete registration form thoroughly. 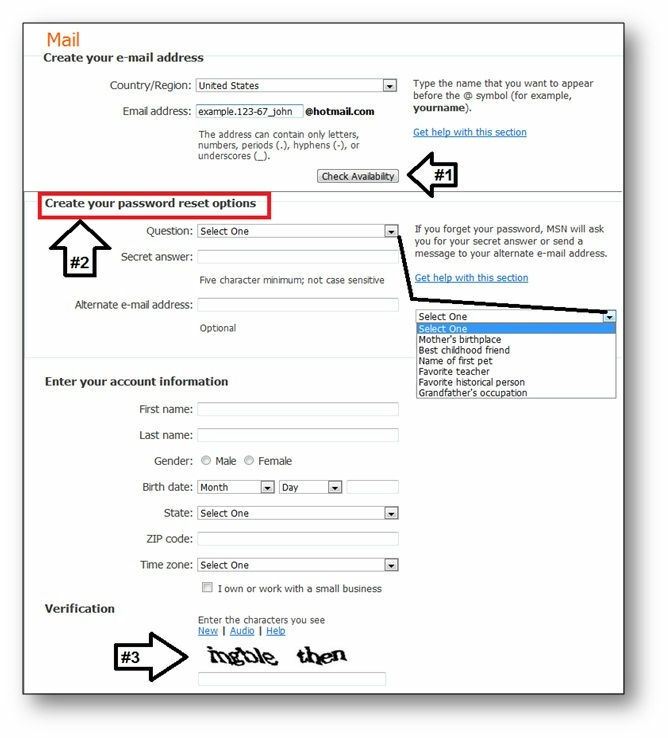 Create your email address in the next form, you have an illustration in the next page. example.123-67_john is the username and hotmail.com is the domain name, this is an example example.123-67_john @hotmail.com. for you to understand what types of characters you can use. As you can see you can use numbers (0-9), periods (…..), underscores(abC_XYz) and hyphens (Ab12—34Xy). The part of the email address before the “at” = “@” sign is also called the user name. In addition you can see that the domain name is appended already and you would only need to create a user name and press the button to (#1) check for availability. It is useful to find a simple combination where it doesn’t require a lot of typing. – One important thing to remember: USERNAMES are NOT case sensitive, but PASSWORDS are CaSe SeNsITiVe. Create your password reset options. This is an important step where you have to use information that is second nature to you, in case that you will misplace your password. These questions will be presented to you when you will try to reset your password. So look at arrow (#2). Then enter your information Name and Address under Your Account Information. Verification (#3) is a form of protection against automated robots. These robots open massive numbers email accounts for spam usage. However the current mathematical algorithms cannot decipher these picture words yet, therefore this “captcha ” slows down the spread of spam, For Now! Email trough a web browser, Internet explorer, Google Chrome, Mozilla Firefox. The (#1) Junk Folder is an automatically maintained folder by algorithms which categorize emails based on their sender, subject, and domain. You might find some useful emails in there and sometimes if you expect important email that was supposed to be sent you, your best bet is to check your junk folder. The junk folder is a preventative method for separating spam and advertisements from important emails. The (#2) Draft Folder here you will find all the emails that you composed and didn’t send or finished, because something came up. You can open the Drafts Folder and then continue with the emails where you left off. The (#3) Sent Items or Sent Folder, here you will find all the emails that you have sent. You can review them and forward them to other people as the need arises. The (#4) Deleted Folder, here you will find all your deleted items. Warning! Most of the email boxes will delete emails from the deleted items within 30 days, therefore make sure that you scrutinize well what you want to delete. The (#5) New Folder, this is used to create new folders to keep your emails organized by category, subjects senders and so on. The (#6) New button allows you to create a new email and then send it to whomever you desire. The (#7) Delete button is used to delete email messages. Just select the checkmark next to the messages you want deleted and then press the delete button. If you want an entire page of messages deleted press the check mark (#12) at the top to control all the messages displayed on that page, and then press the delete button. The (#8) Junk Button is used to send messages to the Junk Folder. Use the checkmark boxes and then press the Junk button. If you want to control or junk all the messages on the page, press the (#12) checkmark at the top of the page, to control all emails and then press the junk button. The (#9) Sweep button is a drop down menu and it allows you to move or delete multiple items from a folder. You have to be careful with this one. If you want to experiment with it, just create a new folder and add a few messages to that folder to experiment with the sweep drop down menu. The (#10) Mark as button is used to mark message as read or unread, flagged , or unflagged and as a phishing scam. IMPORTANT! A phishing scam is a scam where a web site is designed to look and work exactly as that of a bank. But in the address bar of your web browser the address is different than that of the authentic website. This scam is used to collect usernames and password from people that fall into the trap. Read chapter one for measures of protection. The (#11) Move to button allows you to move email messages within folders. It is also a drop down menu and you can see from the little arrow pointing down. The (#12) Checkmark is the checkmark used to select and deselect all the items displaying on one page. 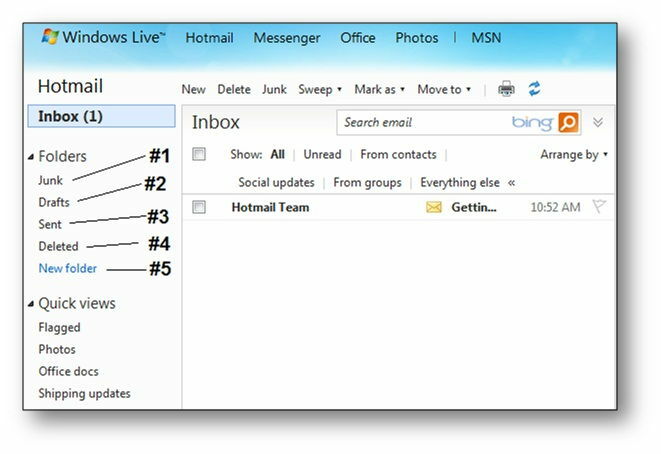 In Hotmail you click the new button (#6) in the previous image. Now we follow the numbers in the next image. #1 is the field where you type the addressee’s email address. Yes you can send emails to yourself with attachments. #2 is the subject field, where you add the title of your email contents. 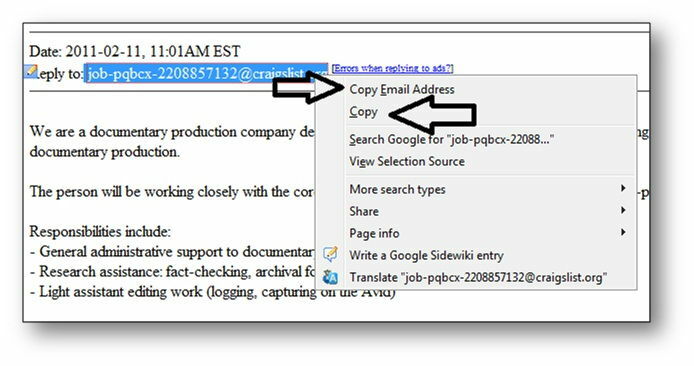 #4 Show CC and Bcc displays the fields for carbon copying and blind carbon copying, basically sending the same email to multiple recipients. Blind Carbon Copying is used to hide the email addresses to your recipients from each other. The arrows pointing down are highlighting your option regarding the email that you’re working on. Send is to send the current email, save draft is to save the email to continue working on it on another time. Therefore you will find the draft email in the email Drafts folder. You can spell check and switch the text type from Rich text to html or plain, or cancel if you have changed your mind in the process of creating the current email. The arrow pointing to the insert: Attachments, Office docs is highlighting where you can attach documents, pictures to your emails. However there is a data cap of usually 10-20 Mega Bytes. So your attachments cannot exceed that amount. The toolbar underneath the attachments offers options for font type, paragraph, indentation, text alignment, font color and bullet points. 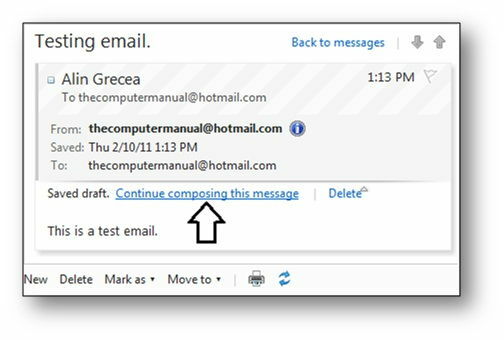 If you ever are trying to continue a saved email draft, you need to click on Continue composing this email to reopen the draft for editing. The Gmail, email from Google. All email functions the same only the layout is different. So the #1Compose Mail is used to create a new email. 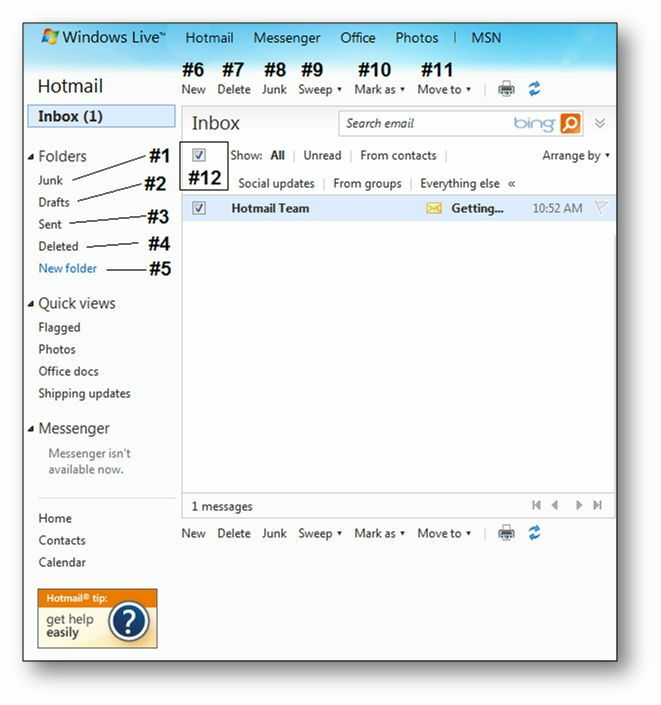 The rest of the buttons have the same functions as the Hotmail account only that the layout is different. In the above image you can see an email address. If you click on this email address, your default email application will open with a new message, and with the destination email pre-populated. But that works only when you have a default email client setup. 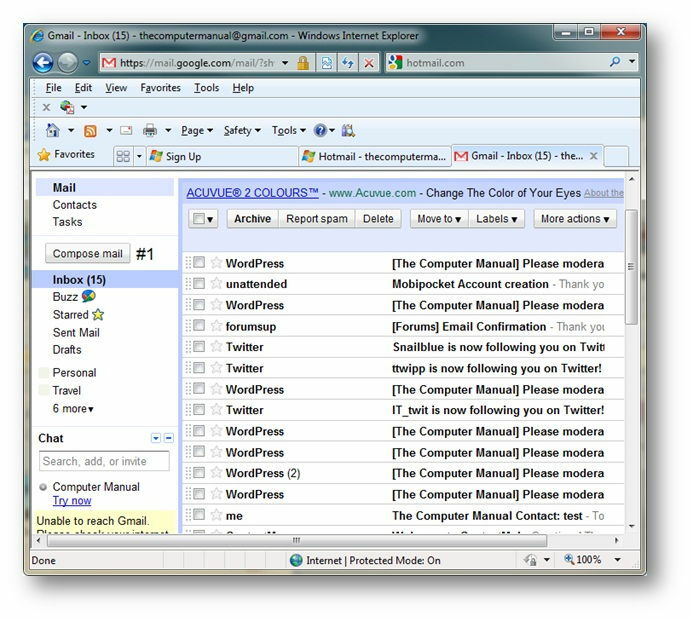 However most of you at home have emails that you can access trough a web browser and not all features work seamlessly. Therefore you would have to highlight the email address, right-click on it and from the popup menu select copy. Then log into your email trough any browser and then compose a new message by clicking either new message or compose, depending of your email provider, and in the addressee paste the email address. This is how you cam sign up and use an email account.